The holidays brought me more photography gear that I’m looking forward to playing with in this brand new year. I’ve already mentioned the Lensbaby Composer that Tammi got me, but that’s not strictly analog and I haven’t really used that on my film Canon yet. These photos are from the Diana Mini that my aunt gave me. The camera is a miniaturized version of the popular Diana toy camera from Lomography. Unlike the ‘grownup’ Diana, the Mini takes 35mm film, which is much more convenient to find and get developed. It also has two frame sizes, square boxes, like you see here or rectangular half frames that effectively double the number of exposures you can make on a roll. I have only just started shooting half-frame, but check back here for an update in the next week. I’m still learning how best to use it, but these are some of the test shots I took last week. Lesson number one for me was that it’s all but useless inside. I’ll have to either only use it outdoors or get really good at timing my shots to the fraction of a second in ‘bulb’ mode. 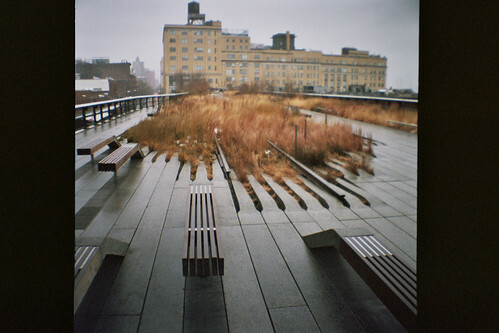 This is my second foray into toy cameras, the first being the Holga, the mastery of which continues to elude me. Between being put off by the medium format film, the lack of metering and the larger shape that makes it more difficult to carry around, I’ve all but given up on learning how to make good photos with it. I’m hoping that the easier to manage Diana Mini can work as ‘training wheels’ to get the hang of shooting with a toy camera. 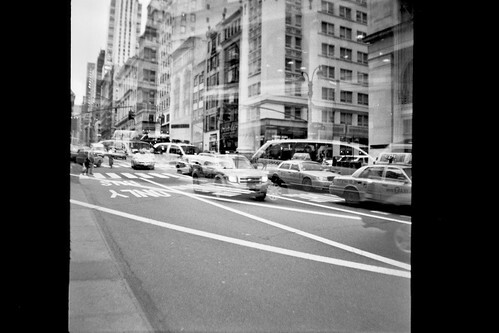 One day, maybe I’ll be ready to graduate to the medium format goodness of the Holga.